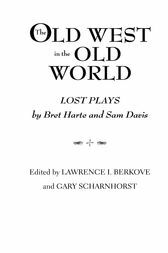 The two plays in this collection, The Luck of Roaring Camp, by Bret Harte, and The Prince of Timbuctoo, by Sam Davis, were written by Old West authors as the nineteenth century transitioned into the twentieth. Both plays are original treatments of Americans in the Old World--France and Africa, respectively. Hitherto, both plays were lost--never published, and forgotten. At first glance, the plays appear to be very different. Harte greatly revised his famous short story to turn its title character into an attractive ingénue sent by her mining camp foster parents to acquire an education and polish in France. There she and the son of an aristocratic family fall in love and confront complications of class and money. In Davis's play, a comic opera, three Americans come to Timbuctoo to exploit it. But two of them decide to support the young prince of the kingdom who is trying to gain his rightful throne and marry the girl of his choice. Despite malicious intrigues, both works end happily, reflecting their authors' Old West beliefs in a society where character takes precedence over birth. Both plays besides being valuable additions to the literature of the period are intrinsically entertaining.